It’s official. I’m completely in love with my new polypro hoop. I resisted trying one because I thought it might be too “advanced” for me, but I’ve found that it has completely changed my hooping and flow for the better because it’s so light. It has quickly become my favorite hoop! I have used the 1/2 inch black irrigation tubing and you would think that they would behave much the same way. But they are very different! The best way I can describe the difference is that the polypro is more responsive and less clunky than the regular tubing. It even behaves differently than my HDPE hoop…it’s much more flexible, which makes certain moves easier. 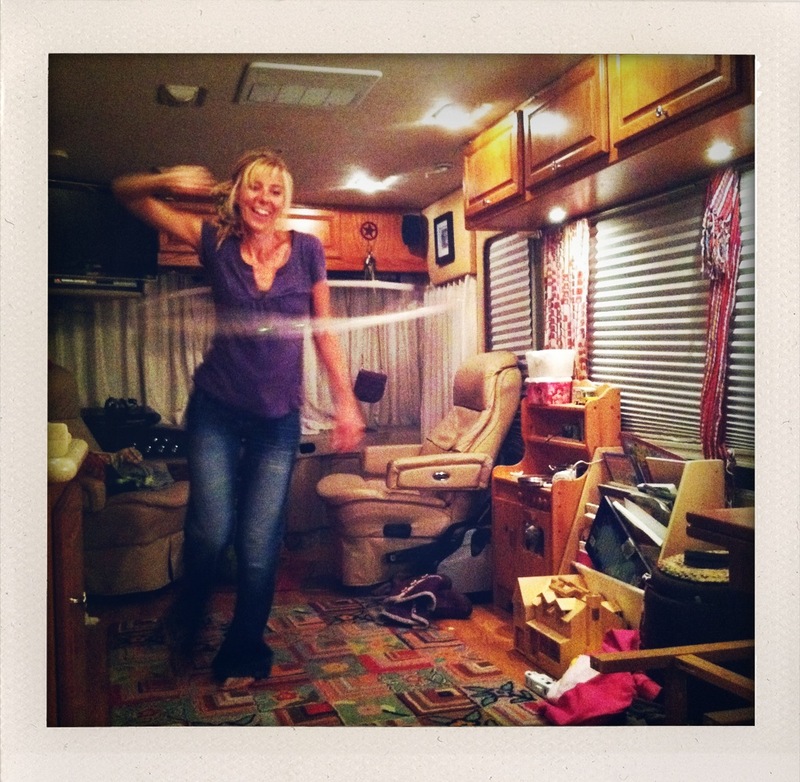 In the photo above, I’m smiling because I’m so HAPPY I can hoop with this smaller/lighter hoop INSIDE the RV! I can spin the heck out of that thing…which is pretty amazing in a small space. With cooler weather upon us, it’s nice to know I can still get my fix. I’ve cut it down to 35 inches and will probably go down to 34 in the next couple of months. That range seems like my new “happy place”. I have the inside of the hoop “lined” with thin white gaffers, and the outside of the hoop is sanded. I’m pretty rowdy with it on gravel and such, so I don’t have pretty mirror tape covering this one. Just a few pieces to give some color. 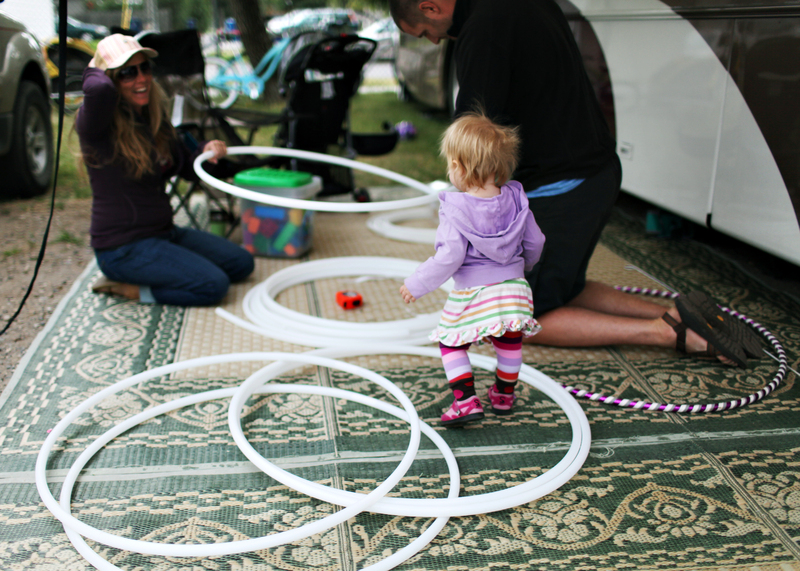 I wouldn’t suggest a polypro hoop if you’re just starting out, but don’t be scared to try one! Try new things…spice it up! You’ll like it. What have YOU done lately to change up your hoop practice? 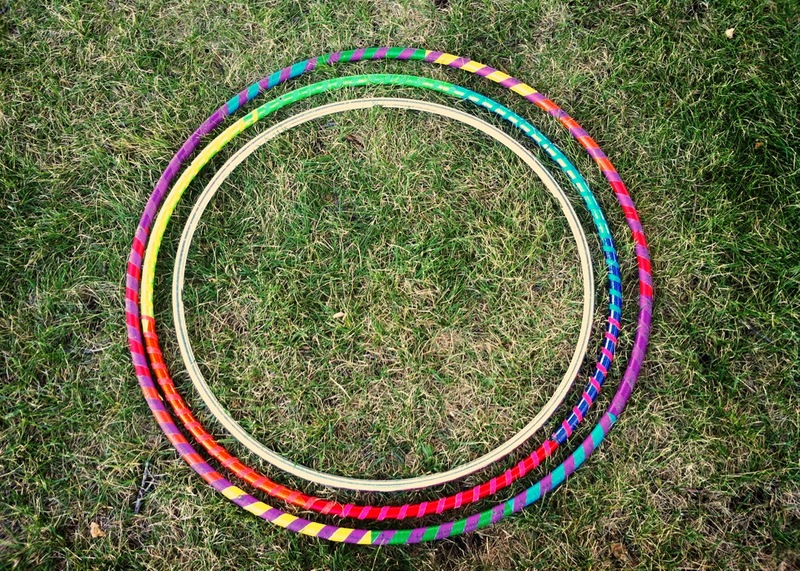 Have any of you tried a polypro hoop? If you want to make your own Polypro hoop, Rich breaks it all down here. Kendra at HappyLoveHoops sells them as well, but her shop is currently closed. When I first started hooping, I was on a mission to find the “perfect” sized hoop. I read forums and obsessed a little about it before I finally made the decision to start with a 42 inch 100 psi 3/4 inch circle of plastic and tape (outer hoop above). It did turn out to be the perfect hoop for learning and I loved it. I thought it would probably take years before I would abandon my first BIG HOOP love. But then, I “outgrew” it for my daily practice. Sooner than I had expected, the time came for me to expand my horizons a bit. I was feeling limited. I was getting bruises (especially while learning the shoulder duck out…that move is brutal!). My next hoop was a 42 inch “lightweight” performance hoop (middle hoop above)…and it made such a HUGE difference switching to a lighter hoop. It wasn’t all that much smaller (same tubing), but the weight (or lack of) made it super easy to throw around off body tricks. I used both hoops quite happily until I started to get into breaks and reverses. A big groovy hoop just doesn’t cut it for a fast, crisp break/reverse! I had read about people “downsizing” their hoop and I was in AWE at those who were using hoops in the 30-38 inch range. At the Hoop Technique workshop, Rich and Spiral told us their “story” and it was then that I realized that Spiral had pretty much pioneered the “shrinking” of the hoop size…and Rich had helped figure out the best plastics with his famous “tube experiments”. My silver HDPE hoop is a 36 inch hoop and I adore it. It’s light & peppy. It does what I tell it to do…and it does it FAST. Sometimes a little too fast 🙂 I’m still learning how to treat it so we can flow together. But for the most part, we have a lovely relationship. I’ve found that my magic hoop size is a super lightweight 38″ hoop. Shoulder hooping is SO much easier with a 38″, compared to the 36″. Nothing can beat the 36″ for speed on the off body moves….but it can be a bit more challenging for core hooping. I bought my silver hoop from Rich and Spiral…but when we were in Bozeman, my friend Mary and I made a bunch of our own HDPE hoops and found them to be rather easy to make. Well, I should say that Mary and Matt made them 🙂 I just reaped the benefits. Rich gives detailed instructions here. I keep lots of sizes on hand…and I go back to the bigger sizes when I’m learning something new. But for now, my go-to hoops are 36 inch and 38 inch. My size may not be your size. Everyone has a hoop that just feels right. Maybe you have no desire to do off body work or breaks and you’re content with the big slow groovin’ hoops! That’s awesome. I just like to do things fast 🙂 The moral of the story: if you want to spice up your hoop practice a bit…switch up your size!